Fans were unfazed as Kentucky National Guardsmen searched bags and passed metal-detecting wands over race-goers in Louisville. 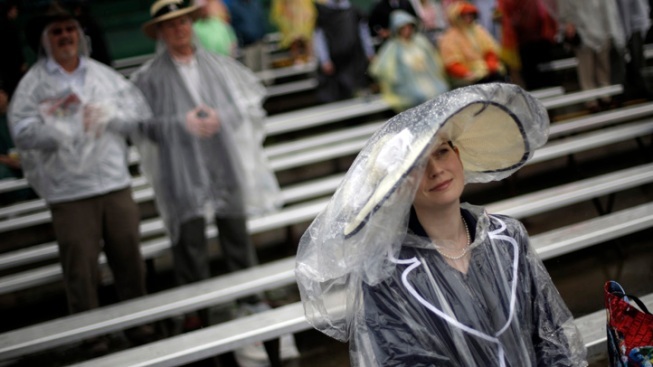 Spectators wait in the rain for the next race during the 139th Kentucky Derby at Churchill Downs Saturday, May 4, 2013, in Louisville, Ky. Rain and extra security measures slowed down the crowds at Saturday's Kentucky Derby, but thousands of poncho-covered racing fans filled Churchill Downs despite the odds. Fans were unfazed as Kentucky National Guardsmen searched bags and passed metal-detecting wands over race-goers in Louisville. The tightened security imposed in response to the Boston Marathon bombings was similar to actions taken after 9/11. "It's expected. It's all good," said Curt Pederson of Seattle. In 2009, the track relaxed some policies, but most of the measures were reinstated this year, including a ban on coolers. Fans this year can purchase disposable coolers inside Churchill Downs, complete with ice. Among other things, the track banned backpacks, large purses and cameras with removable lenses. And despite a forecast for rain all day, umbrellas, as always, were not allowed. "For the real troopers, Derby fans, you got to stick it out. It ain't nothing but another day," said Lanny Westfall, 37, of Louisville, who said he'd been coming to Derby for "30-something years." He had claimed a spot on the backside rail at 6 a.m. with his friend Joan Lynchard of Hot Springs, Ark. The two held a patch of grass with about 20 camping chairs and a four-burner gas grill ready for burgers, brats and pork loin. "I remember coming out here with a bucket of KFC and my sister bringing a blanket," Westfall said. "That was when I was knee-high. This is my Dad's Christmas pretty much, Derby day." Rather than worrying about security, fans were talking betting strategies, which vary as wildly as the colorful hats at the Run for the Roses. 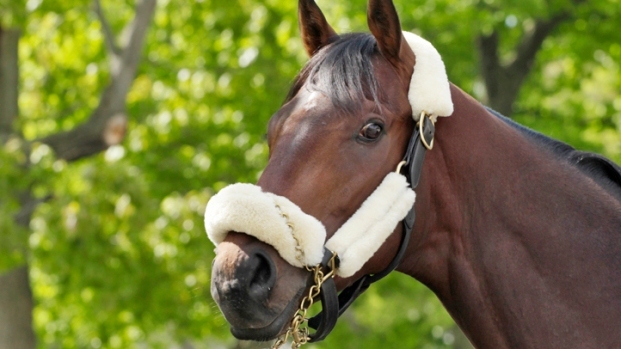 Some fans plan out their wagers days in advance, poring over statistics and previous races. Many others fly by the seat of their pants, choosing an interesting looking horse or colorful jockey silks. "I love cats," said Shelly Dozier-McKee of Atlanta, who decided to bet on Charming Kitten. It was her first trip to Churchill Downs, and Friday night at a party in Louisville, Dozier-McKee said she received some betting tips from former University of Louisville men's basketball coach Denny Crum. She said Crum, who won two NCAA basketball championships, showed her how to bet exactas and trifectas. "I got some good insider tips from him," Dozier-McKee said from under a black, wide-brimmed hat adorned with a feather. Rebecca Thorpe's mother told her to always bet on a gray horse. "She says the gray horse always finishes in the top three," said Thorpe, who traveled to Louisville from Huber Heights, Ohio. Jeremy Hewson, of Greenfield, Ind., said he learned how to bet horses from his grandfather. He said he will study the racing form, looking at speeds and performances in past races. Hewson said the rainy track would factor into his picks, but so far he likes Verrazano in the Derby. "Unless I see something that changes my mind," he said.